Sometime in the Summer of 1991, John Bennison encouraged me to create a set of recordings of piano improvisations. We talked about the how since we knew the where would be the sanctuary of the church we both served. A church member loaned us a beautiful acoustic piano. I had the condenser microphones, but we had to rent some nicer preamps for the recordings direct to DAT. We chose to use the natural reverb and therefore a stereo-Y mic setup somewhat distant from the instrument. The acoustics of the redwood sanctuary were awesome with the carpet-padded pews removed. We knew that my typical inspiration for the piano improvs I created was the liturgy. So we created mini-rituals and chose a few church members to join us for them. Each of them centered on the words and melody of a well-known hymn. Sometimes, the lyrics were simply recited. Other times, there were readings that surrounded the story told by the lyrics or the songwriter’s life. More rarely, we would sing a bit of the tune. Then, I would move to the keyboard. The other participants would try to be as quiet as possible. Often, the creaking of the redwood timbers would be the only other sound on the recording, though a few were scratched because of rustling pages (used to read some part of the ritual) or an ambulance siren shrieking on a nearby road. After the recordings were completed, John and I sifted through them for months, choosing the “best” or most representative of a particular tune. There was no mixing. Just mastering and sending off to the cassette tape duplicator. Yes. It was still the age of the cassette. John and I have each moved on (a few times). I’m glad that we have also stayed in touch more closely than any other long-distance friend I can think of over such a stretch of time. The last time I moved, I found a handful of those cassettes still stored in my studio. 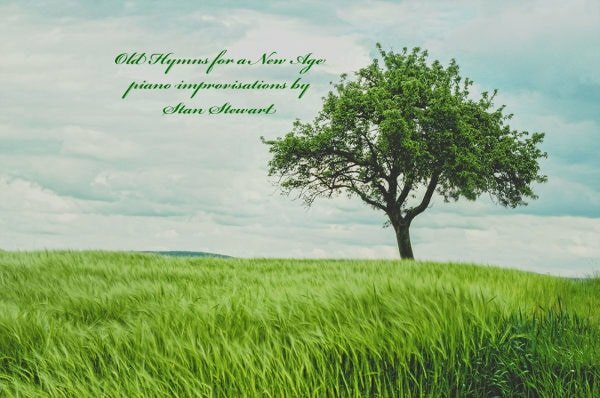 That find inspired me to re-release “Old Hymns For A New Age”. Unfortunately, the master DATs would no longer playback, so I had to choose from the best of my backup files. But finally, here’s the re-release of the album (with an added bonus track from the Painting Piano session) for you to hear again decades later. You’ll decide if they’ve stood the test of time. Very inspiring, Stan, even for an old atheist like me. Music really has no religious tinges one way or another; if it’s good and your heart and mind are open, it’ll transpose you to a place of truth and integrity. I’ll stop before the duo platitude & cliche ruin the experience. lol Thanks for this. I hear you, Wesley! I’ve rarely darkened the door of a church in the last 2 decades and my ears still tingle to hear certain churchy tunes. Thanks, Dennis! I’ll be in touch.